Property Location With a stay at Hotel Don Luis Puerto Montt, you'll be centrally located in Puerto Montt, steps from Casa del Arte Diego Rivera and Antonio Felmer Museum. 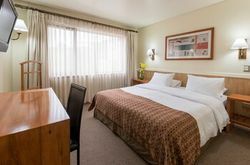 This hotel is within close proximity of Plaza de Armas and Puerto Montt Cathedral. Rooms Make yourself at home in one of the 60 guestrooms featuring minibars and LED televisions. Complimentary wireless Internet access keeps you connected, and digital programming is available for your entertainment. Bathrooms have shower/tub combinations and hair dryers. Conveniences include phones, as well as safes and desks. Amenities Don't miss out on recreational opportunities including a sauna and a fitness center. This hotel also features complimentary wireless Internet access, concierge services, and a fireplace in the lobby. Getting to nearby attractions is a breeze with the area shuttle (surcharge) that operates within 20 km. Dining Grab a bite to eat at the hotel's restaurant, which features a bar, or stay in and take advantage of room service (during limited hours). Quench your thirst with your favorite drink at a bar/lounge. A complimentary buffet breakfast is served daily. Business, Other Amenities Featured amenities include a business center, complimentary newspapers in the lobby, and dry cleaning/laundry services. Event facilities at this hotel consist of conference space and meeting rooms. A roundtrip airport shuttle is provided for a surcharge (available 24 hours), and free self parking is available onsite. Know Before You Go * One child 6 years old or younger stays free when occupying the parent or guardian's room, using existing bedding. * Only registered guests are allowed in the guestrooms. Fees The following fees and deposits are charged by the property at time of service, check-in, or check-out. * Airport shuttle fee: USD 25 per vehicle (one way) The above list may not be comprehensive. Fees and deposits may not include tax and are subject to change. Mandatory Fees and Taxes You'll be asked to pay the following charges at the property: * The national sales tax (19%) is charged upon check-out to citizens of Chile regardless of length of stay and to foreigners staying in the country for 60 consecutive days or more. To qualify for a tax exemption, foreigners must pay for their stay in foreign currency (not in Chilean pesos) and present a valid passport along with the migration card they received upon arrival in the country at check-in. Furthermore, the tax may apply per room when the room is shared by a taxable and a nontaxable guest. We have included all charges provided to us by the property. However, charges can vary, for example, based on length of stay or the room you book. Nos fuimos de viaje a Puerto Montt donde estuvimos parando en Hotel Don Luis. La atención fue muy buena. Realmente recomendable.